It's Saturday, Thanksgiving is over, and the holiday season is in full swing!! And guess what? So are those holiday treats!! But trust me when I say, there ARE healthier versions of some of your favorites! And they are delicious too! 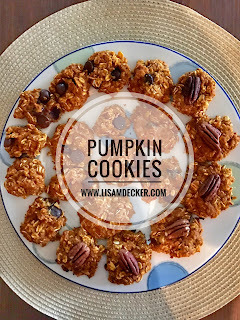 I made these pumpkin cookies last week with my daughter and they were a hit!! Both of my girls (5 and 6 years old) and my husband gobbled them down (along with myself!)! 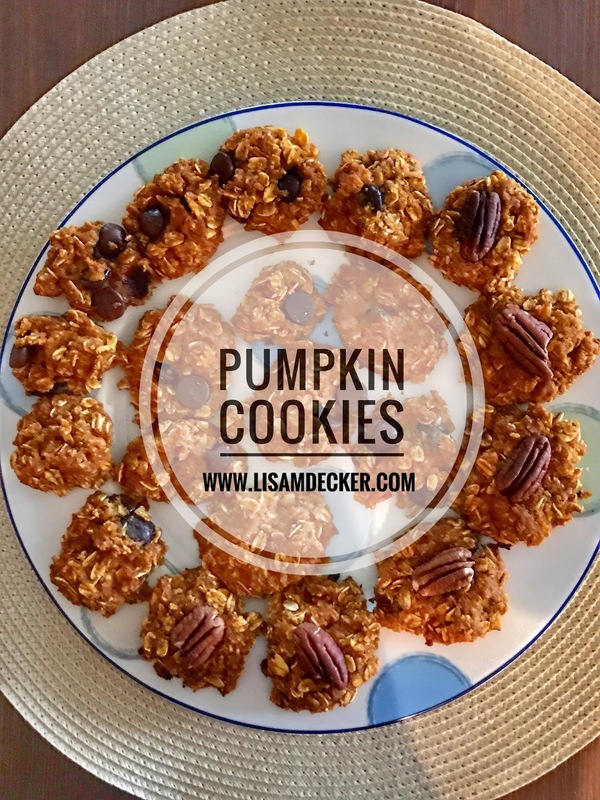 The recipe came from the Team Beachbody Blog and the only change I made was that I added some dark chocolate chips as per my daughter's request! 1. Preheat oven for 350° F.
2. Lightly coat two baking sheets with spray. Set aside. 3. Combine oats, almond flour, cinnamon, cloves, ginger, and salt in a medium bowl; mix well. Set aside. 4. Combine egg, pumpkin, and maple syrup in a large bowl; mix well. 5. Add flour mixture and chopped pecans (and/or chocolate chips if you are using them) to pumpkin mixture; mix until blended. 6. Drop by rounded Tbsp. onto prepared baking sheet; flatten cookies with a spatula. Top each cookie with a pecan half. 7. Bake for 14 to 15 minutes or until firm.